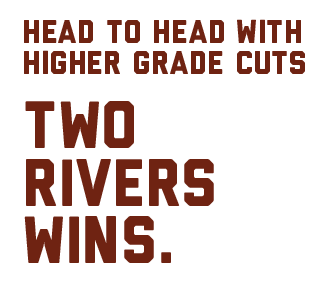 Each of the Two Rivers Chophouse rib eyes outperformed USDA Choice ribeye for overall liking. Two Rivers ribeye were also rated significantly higher on quality, satisfaction, tenderness, juiciness, color and flavor. The following illustrates cost savings based on purchasing 10 cases (700 lbs) of Two Rivers product per week for one year.